on the Fermi surface and have evinced considerable interest. allow a variety of chemical substitutions to be made. develop a theoretical understanding of these materials. help in the current flurry in the field. is not so clear cut. ported by . The values so quoted are: 6 and 12 MeV. termining the gap/s—a remark borne out by what follows. in  and via penetration-depth measurements in . for the CPs and hence to two gaps. subsequently applied [14,15] to a variety of CSs. the Fe or/and the Ba and As ions. modes of vibration of the two bobs of a double pendulum. 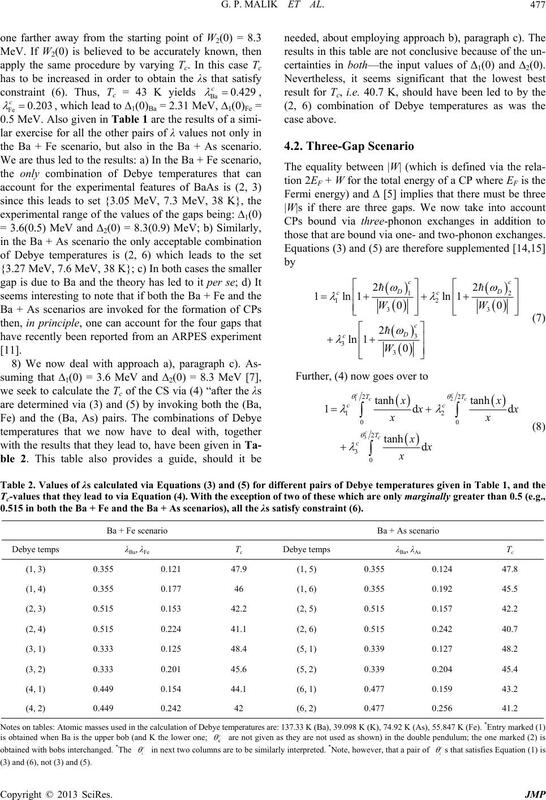 be characterized by two values of the Debye temperature. in Table 1, where they are marked from (1) to (6). 2(0) via (5), or 1(0) via (3). G. P. MALIK ET AL. signature of the node or line-node reported in [17-19]. (3) and (6), not (3) and (5). uncertainty that GBCSEs can help to resolve. the Ba + Fe scenario, but also in the Ba + As scenario. certainties in both—the input values of Δ1(0) and 2(0). those that are bound via one- and two-phonon exchanges. 0.515 in both the Ba + Fe and the Ba + As scenarios), all the λs satisfy constraint (6). based on its characterization via 2- and 3-gap scenarios. been studied with avid interest as evidenced by [17-19]. 0, No. 11, 2008, pp. 3296-3297.
to which GBCSEs are applied is an important parameter. here needs to be assessed in light of this limitation. ongoing work concerned with the other iron-pnictide SCs. experimental values of its Tc and at least some of its gaps. 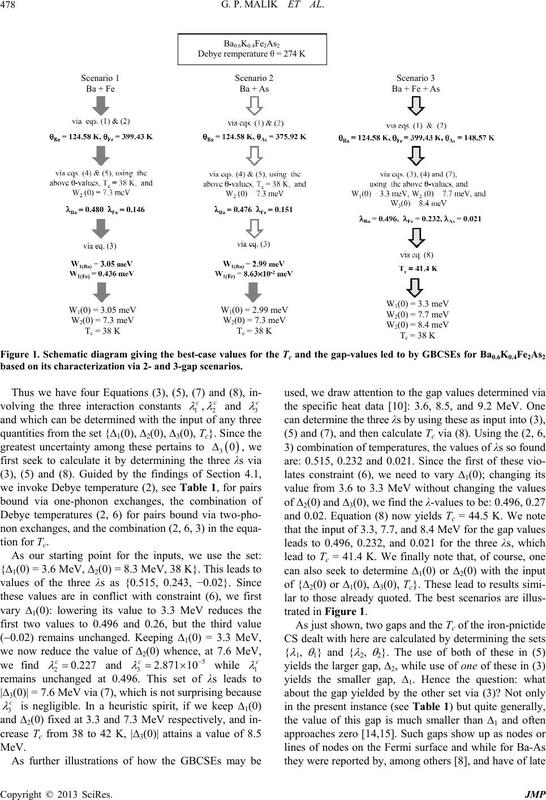 Based Layered Compound LaO1−xFxFeAs,” Nature, Vol. Japan, Vol. 78, 2009, Article ID: 062001. 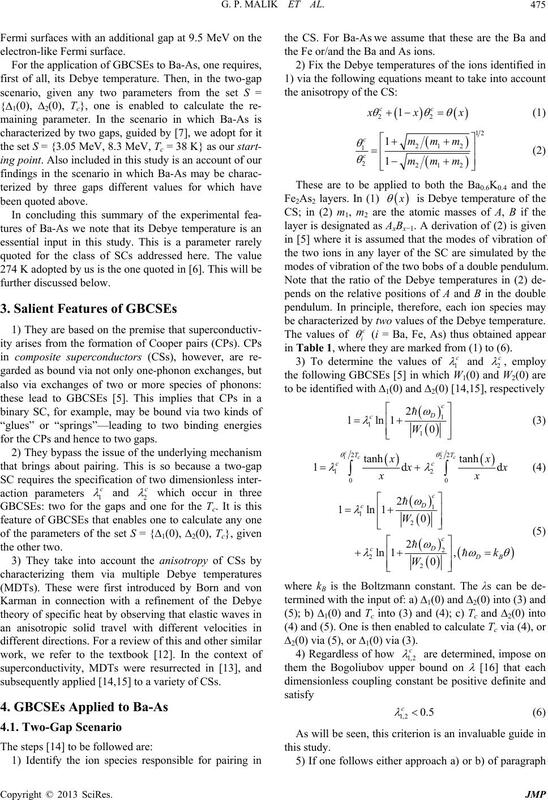 Journal of Modern Physics B, Vol. 24, No. 9, 2010, p.
Ba0.6K0.4Fe2As2 Single Crystals,” Physical Review B, Vol. 79, No. 17, 2009, Article ID: 174501. 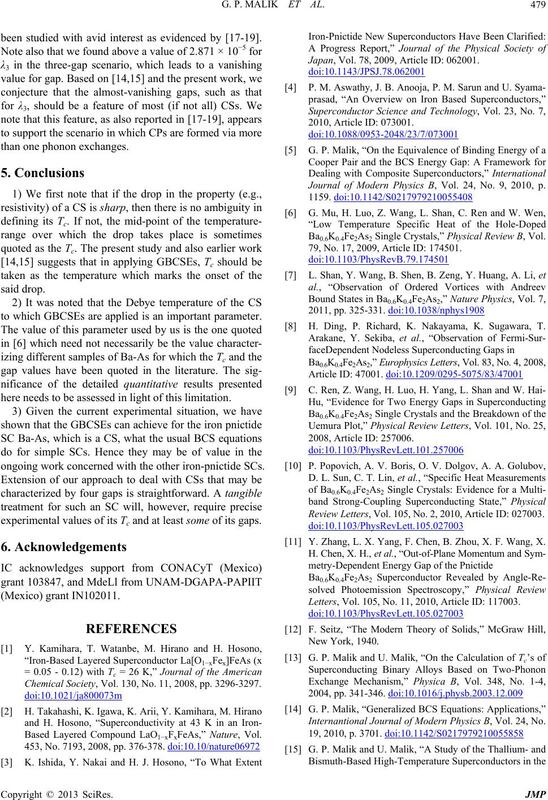 H. Ding, P. Richard, K. Nakayama, K. Sugawara, T.
Review Letters, Vol. 105, No. 2, 2010, Article ID: 027003.
Letters, Vol. 105, No. 11, 2010, Article ID: 117003. 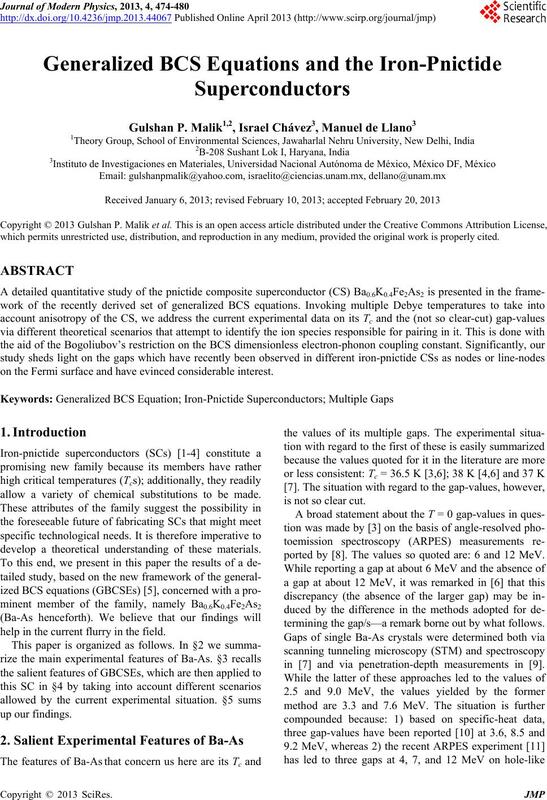 Internantional Journal of Modern Physics B, Vol. 24, No. Press, New York, 1964, p. 206.
ture Physics, Vol. 8, 2012, pp. 364-365. 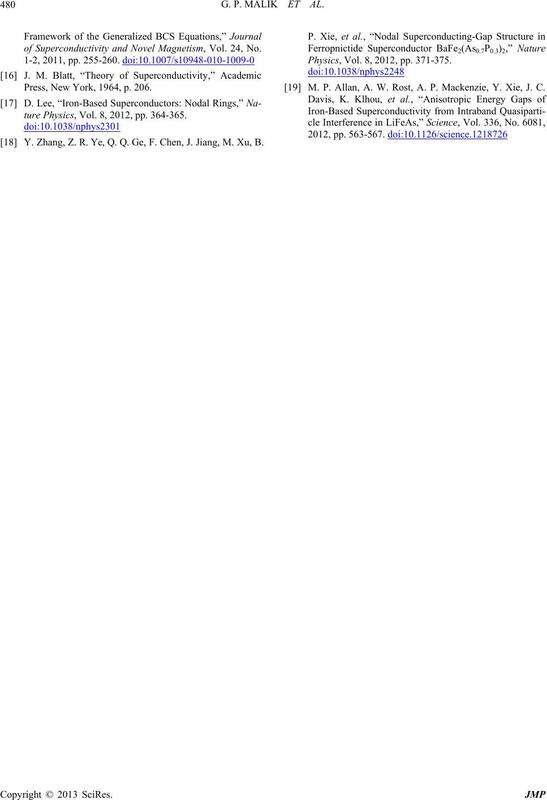 Y. Zhang, Z. R. Ye, Q. Q. Ge, F. Chen, J. Jiang, M. Xu, B.
 M. P. Allan, A. W. Rost, A. P. Mackenzie, Y. Xie, J. C.